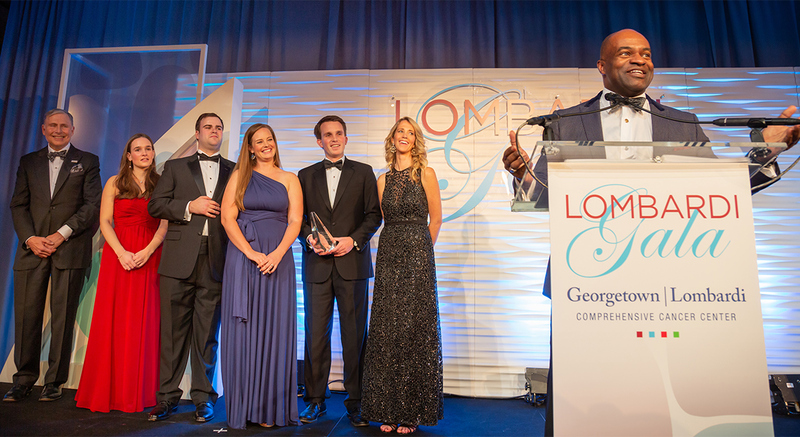 Members of the Hodges family presented DeMaurice “De” Smith, executive director of the NFL Players Association, with the Margaret Hodges Leadership Award for his unyielding support of Georgetown Lombardi. 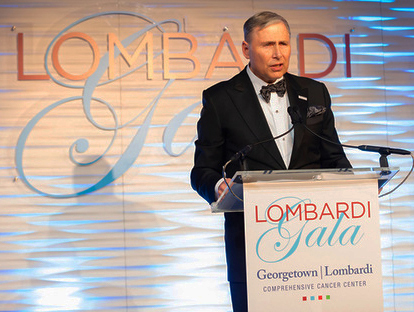 (November 20, 2018) — Each year, when the Margaret Hodges Leadership Award is bestowed on an individual who has demonstrated exceptional dedication to Georgetown Lombardi Comprehensive Cancer Center, recipients have expressed their admiration of Margaret Hodges, who helped found the Lombardi Gala. At this year’s 32nd Annual Lombardi Gala, those words of admiration carried an even greater depth as attendees remembered Hodges, who died September 26 after a spirited and accomplished life of public service and philanthropy. 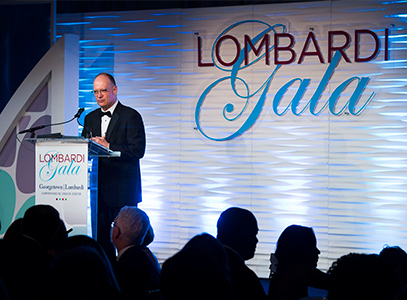 Georgetown University President John J. DeGioia announced that the evening was dedicated to the memory of Margaret Hodges, who helped found the Lombardi Gala. “We would like to dedicate tonight’s program to the memory of Margaret Hodges, and I would like to extend, on behalf of Georgetown University, our heartfelt gratitude and thanks for all that she has done,” said John J. DeGioia, Georgetown University president. Her legacy was palpable Saturday evening as nearly 700 people gathered for the black-tie event at The Ritz-Carlton hotel and raised nearly $1.3 million for Georgetown Lombardi’s cancer research, education and treatment efforts as the sole National Cancer Institute-designated comprehensive cancer center in the D.C. region. “She has remained proud of all the great work Georgetown Lombardi has done and I’m sure rests more peacefully in heaven today knowing that all in this room have contributed mightily to its continued success,” said Pierre Lapeyre III (B’15), one of Hodges’ grandchildren. Considering Hodges’ deep commitment to Georgetown University — having served as a member of the Georgetown University board of regents and received the Patrick Healy Award from the alumni association — and Georgetown Lombardi in particular, she would have undoubtedly wanted the Margaret Hodges Leadership Award recipient to have demonstrated a similar commitment to the institution and its promise as an engine of oncology breakthroughs. NFL Players Association Executive Director DeMaurice Smith accepted this year’s Margaret Hodges Leadership Award. 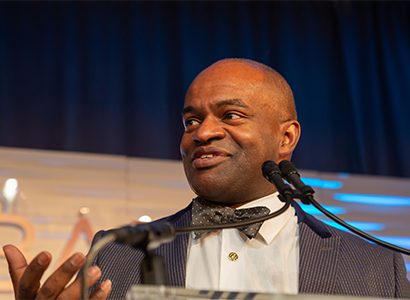 For his unyielding support of Georgetown Lombardi, DeMaurice “De” Smith, executive director of the NFL Players Association (NFLPA), was named the 2018 recipient of the award, which was presented by members of the Hodges family. “This community has benefited greatly from the leadership of De, and the generosity of the NFL Players Association for Georgetown Lombardi and this event,” said Samantha Hodges, one of Hodges’ grandchildren. “Year after year, he has educated us, inspired us, and of course, made us laugh,” she added. As just one example of the many ways in which Smith exhibits his commitment to supporting Georgetown Lombardi’s mission, this was his ninth year serving as honorary chair of the Lombardi Gala. Smith’s wife, Karen, is a breast cancer survivor. They both have worked diligently to advance fundraising for Georgetown Lombardi over the years. “Here’s to never having to say goodbye — to a friend, to a mother, to a wife, to a brother, to a loved one,” De said emotionally after describing how cancer has impacted his family. Watch a Lombardi Gala video featuring 2018 Margaret L. Hodges award recipient DeMaurice “De” Smith. While playing 11 seasons in the National Football League and earning the MVP title in Super Bowl XXVI as quarterback of the victorious Washington Redskins in 1992, Mark Rypien’s life changed forever. He lost his 3-year-old son to brain cancer in 1998. But Rypien found a way to transform his pain and sorrow into action and advocacy, founding Portland-based childhood cancer awareness and aid organization, the Rypien Foundation. Former NFL player Mark Rypien, who created a foundation after losing his son to cancer, received the 2018 NFLPA Georgetown Lombardi Award. 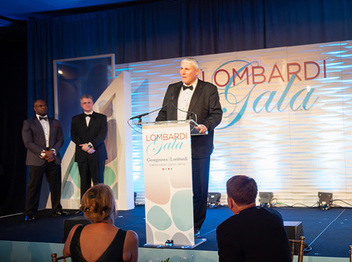 Because of his persistent and effective efforts to help children and families impacted by cancer, Rypien was this year’s NFLPA Georgetown Lombardi Award recipient, established to honor a leader in the sports industry whose life and family have been touched by cancer, and who encourages cancer research, prevention and treatment through awareness and philanthropy. Through his foundation, Rypien has provided significant support to Providence Sacred Heart Medical Center, which is near his home in Spokane, Washington. This includes funding for two Child Life Specialist positions, music and art therapy programming, an emergency center, and more recently, a school that provides hospitalized children with continued enrichment to prevent them from falling behind. “He demonstrates that spirit through his charitable actions, through his foundation’s work, and his endless hours in pursuit of ensuring a better day for others,” said Vincent Lombardi II (F’89) who with Smith, presented Rypien with the award. “Events like this really make our world a better place”, said Rypien, who took a moment to honor both cancer survivors and members of the military who were present. Georgetown Lombardi Director Louis M. Weiner, MD, announced that Filipa Lynce, MD, was the recipient of this year’s John F. Potter, MD, Award. Filipa Lynce, MD, a physician researcher at Georgetown Lombardi who studies targeted therapies for breast cancer, was recognized during the Lombardi Gala as the recipient of the John F. Potter, MD, Award. Named for the cancer center’s founder, the annual award celebrates the achievements of early career scientists. As a member of the developmental therapeutics program at Georgetown Lombardi, Lynce’s published studies have included topics such as health disparities in breast cancer, hereditary breast cancer and obesity in lymphoma survivors. Her commitment to the highest-quality clinical research and patient care makes her stand out among other early career scientists in her area of focus. “Dr. Lynce is an inspiring young researcher whose work to combat breast cancer and related health disparities represents the best of what we stand for at Georgetown and the Lombardi Cancer Center,” said Louis M. Weiner, MD, director of Georgetown Lombardi. Toward the end of the evening, the audience reacted enthusiastically to learn in a surprise announcement from Weiner about two new $1 million gifts, both aimed at bolstering the cancer center’s immunotherapy efforts. Watch a Lombardi Gala video featuring Agnese Arnold, a colorectal cancer survivor, describe her journey battling cancer with her family. A $1 million gift from the Elsie & Marvin Dekelboum Family Foundation will enable Georgetown Lombardi to invest in a state-of-the-art instrument that will become the bedrock for a new Center for Personalized Immunotherapy, designed to focus on treatments for the 80 percent of cancer patients for whom current immunotherapy methods are ineffective. 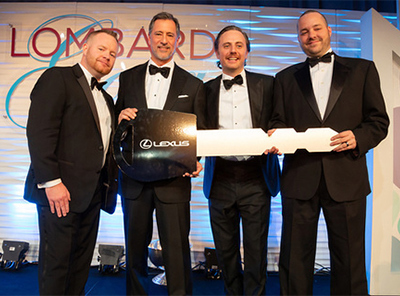 Representatives from Washington Area Lexus Dealers announced the winner of a 2019 Lexus ES F SPORT after a raffle that raised money for Georgetown Lombardi. Inspired by their sustained devotion to advancing a cure for cancer, Weiner also announced a $1 million gift from Jeannie and Tony Loop. The gift is designated for the work of Samir Khleif, MD, an immunotherapy scientist at Georgetown Lombardi whom they supported last year with a separate, commensurate gift establishing the Jeannie and Tony Loop Immuno-Oncology Laboratory. As a final surprise, Ryan Garvey became the winner of a 2019 Lexus ES F SPORT after a raffle drawing for the luxury vehicle in support of Georgetown Lombardi. The donor of the raffle prize, Washington Area Lexus Dealers, has been a partner for the last 15 years and the source of over $700,000 in gifts. The co-chairs of this year’s Lombardi Gala were Geraldo “Jerry” and Catherine Conway Castro (B’88), Bruce Merlin Fried and his wife, Lisa Hill. Georgetown Lombardi wishes to thank this year’s sponsors and all others who helped make the Gala a success. View the complete list of event sponsors.